My most recent activity has not involved any dyeing. Instead, I have been spinning alpaca fleece from Sussex-bred alpacas and then knitting scarves from the beautifully soft hand-spun yarn. 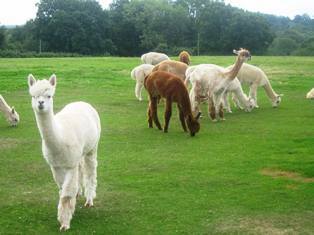 The alpacas have been bred at Hartfield, East Sussex by Caroline Vickery, who together with her mother, Beverley Vickery, has a prize-winning flock of over 50 alpacas, whose natural fleece colours range from white, tan, dark brown to black. The fleece can be supplied in its raw state, just as it comes off the animal, or as washed and carded fleece. I prefer the washed and carded fleece, which is soft and wonderful to spin, and I have enjoyed experimenting with stripes or plying two different colours together to create a marled effect. 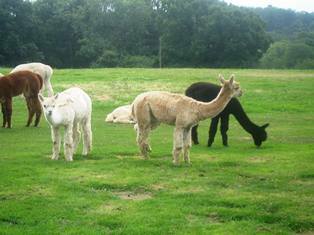 As the photos below show, the alpacas are charming, friendly, curious creatures and clearly thrive in the Sussex Weald. 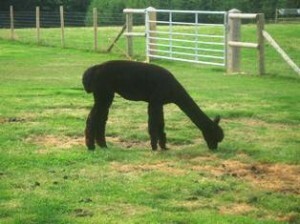 For further information look at the website www.alpacassale.net/ or enter “Alpacas at Wealden Sussex” into your search engine. 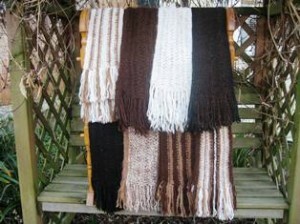 The photo below shows some of the scarves I have knitted. Now I just have to sell some before I start making more!